It’s come up on my VAAI v2 (NFS) write-up that today there are only two products that offer vSphere Storage API for Array Integration for NAS (VAAI-NAS) integration with vSphere 5. We all know that more will be coming, and we all hope it’ll be sooner, rather than later. Personally, I predict that Isilon will be the next storage array with full VAAI-NAS support in VMware’s Compatibility Guides. How can I be so confident? I’ve seen it in action, and next week you can, too. On Thursday 9 August, James Walkenhorst (@walkjaw) of Isilon and I will be jointly hosting a webcast to give you an advance look at the upcoming Mavericks release of Isilon’s OneFS (due to be available in Q4 of this year), including the first-ever public demonstration of these features. Here’s the agenda slide from the presentation we’ll be giving. As you can see, we’ll review the Isilon architecture, and review the VAAI-NAS features, and then show the actual demo of these features. I think you’ll be as impressed by the performance boost as I was. 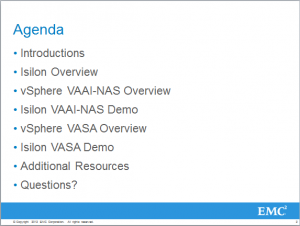 After showing VAAI, we’ll review the vSphere Storage API for Storage Awareness (VASA). VASA allows vendors and VMware admins to define characteristics they can associate with specific datastores. After defining these characteristics, you can create storage profiles. You associate new VMs with storage profiles. Why do that? Because VASA will then automatically place newly-created VMs on the appropriate datastore based on the info you provided. This lays the foundation for fully-automated Cloud environments. We’ll be presenting live on Thursday 9 August at 11:00EDT. I’m hoping you’ll be able to join us. Even if you’re unable to make that time, if you’re interested in the topics we’ll be covering, you should register for the webcast anyway. For registering, you’ll be emailed a direct-link to the on-demand recording of the webcast as soon as it’s made available (usually within 24 hours after the event). You can register for the webcast by clicking here. This entry was posted in VMware and tagged EMC, Isilon, Storage, VAAI, VASA, VMware, vSphere5, Webcast. Bookmark the permalink. The webcast was 9 August 2012. You can view the recording of it online here.